The all-new Subaru Levorg sports tourer concept made its world premiere at the 2013 Tokyo Motor Show, hinting at a new vehicle currently under development for market launch in Japan in 2014.
words 'Legacy', 'Revolution' and 'Touring', and the concept blends the practicality of a tourer with the stylish design and feel of a sports car. 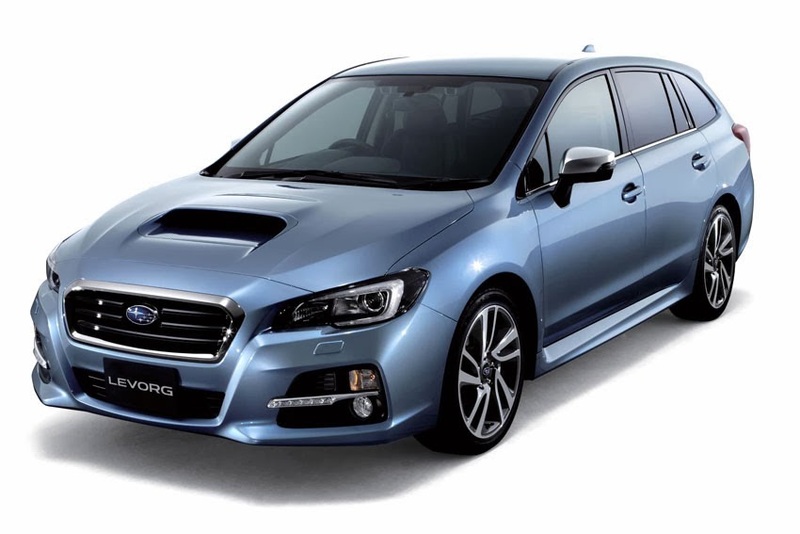 The front of the Levorg features Subaru's unified design motif, the hexagonal grille, while the shape of the new 'hawkeye' headlights helps emphasise the car's low, wide stance. Its sleek profile is optimised for high aerodynamic efficiency and conveys the Levorg's performance potential, yet also leaves no doubt about its practicality and touring credentials. The Levorg concept sees the introduction of an all-new 1.6-litre horizontally-opposed Direct Injection Turbo (DIT) Boxer engine, which produces 168 bhp and 184 lb ft torque, designed to offer smooth performance and greater environmental efficiency. The Levorg has also been engineered with a new high-performance 2.0-litre DIT Boxer engine in mind, producing 296 bhp and 295 lb ft torque. Both new engines are mated to Subaru's Lineartronic CVT. The Sport Lineartronic transmission fitted as standard to the 2.0-litre engine features an eight-speed shifting mode, which allows for either a more relaxed or a sportier drive and decisive acceleration. The Subaru Levorg makes extensive use of ultra-high tensile steel throughout its body for weight saving and rigidity. The concept's independent suspension system and electric power steering allow immediate responses to driver inputs and high cornering limits in all conditions, without compromising the level of comfort expected of a practical tourer. With a stiff, light-weight body and Subaru's Symmetrical all-wheel drive system at its core, the Levorg benefits from world-class safety performance. Vehicle Dynamics Control (VDC) and Active Torque Vectoring ensure predictable handling and among best-in-class hazard avoidance. New safety structures for the bonnet and bulkhead, and greater use of collision-absorbing materials in the engine bay, further improve crash safety performance and pedestrian protection. The Levorg previews new safety technology destined for future Subaru models, including Hazard Avoidance Assist, which provides steering assistance if the system anticipates a collision, and Pre-Collision Reverse Throttle Management, which restricts engine output if the car detects sharp and unexpected acceleration while in reverse. Subaru's innovative EyeSight driver assist system has been updated for the Levorg, and now features greater visibility and wider viewing angles for the Active Cruise Control and Pre-Collision Braking Control systems. The next-generation EyeSight introduces a new Active Lane Keep System. The interior of the Levorg features high quality materials and a rich design, with piano black and metal trim accents throughout the cabin. Instruments feature ice blue lighting to emphasise the high-tech look, while a new 3.5-inch LCD colour display shows the status of the vehicle to the driver at all times. A small-diameter flat-bottomed D-shaped steering wheel affirms the car's sportiness.